Generalgouvernement. (Map: Generalgouvernement.) Political administrative entity comprising the central part of Poland occupied by Nazi Germany in 1939–45 but not incorporated directly into the Third Reich. The capital of the Generalgouvernement was Cracow. It was created by Adolf Hitler's declaration of 12 October 1939 and was essentially a German colony with a totalitarian regime and only minimal rights for the local population. The Nazis persecuted the inhabitants and deported hundreds of thousands of people to work as forced laborers (see Ostarbeiter) in Germany. Initially composed of Kielce, Cracow, Lublin, and parts of Łódź and Warsaw voivodeships, it had an area of 95,000 sq km and a population of some 12 million. The Generalgouvernement included the borderlands of Western Ukraine—Podlachia and the Lemko region, Kholm region, and part of the Sian region; covering some 16,000 sq km, these territories had 1.2 million inhabitants of whom 525,000 were Ukrainians and 170,000 were Ukrainian-speaking Roman Catholics (latynnyky). After Germany invaded the USSR, Galicia (the voivodeships of Lviv, Stanyslaviv, and Ternopil) was annexed to the Generalgouvernement on 1 August 1941, increasing its territory to 145,000 sq km and its population to 18 million. Ukrainian territories in the expanded Generalgouvernement covered 63,000 sq km with a population of over 7 million, of which the total number of Ukrainians was nearly 4 million, excluding 500,000 latynnyky. 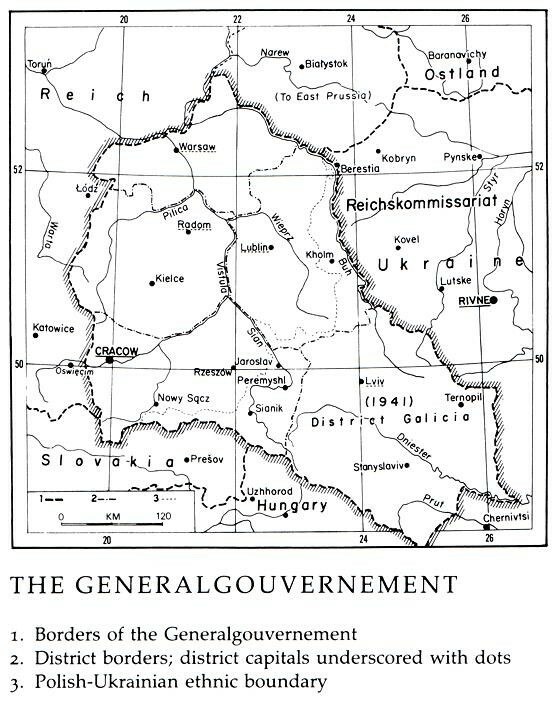 The organization of the Generalgouvernement resembled that of a centralized administrative unit of the Third Reich but was closer to that of a directly occupied territory (eg, Reichskommissariat Ukraine) than to a pseudo-state formation like the Protectorate of Bohemia and Moravia. All power was in the hands of the Nazi governor-general Hans Frank, who acted directly on Adolf Hitler's orders and was accountable to him alone. All responsible positions in the administration were staffed by Germans; Polish and Ukrainian officials were used only in minor capacities. The central administration consisted of 12 (later 14) main departments and a Secretariat of State. The territory was divided into five districts, each with a corresponding administrative structure. Limited local self-rule existed, although officials and members of consultatory councils were appointed, and the Führerprinzip was adopted everywhere. Ukrainians were in a minority in the Cracow and Lublin districts but formed the majority in the ‘Distrikt Galizien’, governed by Otto von Wächter. Galicia was annexed to the Generalgouvernement against the will of the Ukrainian population, dashing all hopes that the Ukrainians may have had to statehood and to political independence. The local language (Ukrainian or Polish) was used together with German in the courts, local administration, and schools. In order to promote cultural and welfare activities, and to stimulate some areas of the economy, the Ukrainian Central Committee (1939–45) was created in Cracow and the Ukrainian Regional Committee (1941–2) was founded in Lviv. These social institutions were controlled by the Germans.